For some authors, making the leap into self-publishing is an easy and natural extension of their past activities. For others the move can seem strange and overwhelming. Since we know it’s hard to do right by your book if you’re feeling overwhelmed, it makes sense to try to set yourself up to succeed. If you’ve decided you want to self publish a book, there are a number of ways you can go about this. Here are six of the best ways to get your self-publishing career on the right track. Treat it like a business For most authors, writing is an avocation, something you fit into the rest of your life. It may be a private refuge of creativity, a space that’s outside the storms of day to day life. But book publishing is a business, and a self-publisher has a responsibility to run her business efficiently, and at a profit. You should expect the same. For example, Christy Pinheiro’s The Step-by-Step Guide to Self-Publishing for Profit shows how she created a business out of publishing specialized education books year after year. Dan Poynter’s Self-Publishing Manual has a section on the importance of recordkeeping and alternate methods of financing. Head over to the blogs of self-published authors like Michael N. Marcus and April L. Hamilton to see how they use opinion to their advantage. Discover the marketing mindset When you were only an author, you just worried about the development of your manuscript. Now that you’re the publisher, you begin to see the world differently. The local bookstore becomes a potential signing and community outreach. The subject of your book will influence how you see the opportunities the world presents you. Marketing your book becomes a new way to interpret the world. Self-published author John Kremer specializes in innovative ways to market books and provides lots of free information online. Become a broadcaster You’re an author, one of your skills might well be an ease at communicating. With the emphasis on developing an author “platform” well before publication date, reach out to your audience through a blog or an email newsletter or whatever way feels appropriate to your readership. Begin a dialogue or at least create a space in the world where fans and media will be able to get information on your book, your marketing appearances, and your press materials. Check out JA Konrath’s blog for a self-published author who’s been online building his audience since 2005. Start working on your next book All the work you put into establishing your publishing company, learning how to produce and market your book, all the work you’ve put into your initial communication channels and peer networking can be used for your next book. 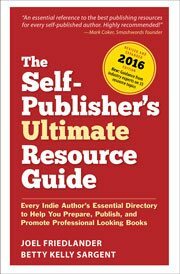 Planning your next book—particularly if it’s related in subject to your first book—will establish your publishing company as different than most other self-publishers. You will put yourself in the position to combine two amazingly divergent careers, by being both an author and a publisher. I agree with you completely, but specifically #5 gets to me and that’s something I really need to improve. I always see myself as the talent and being both the talent and the publisher is extremely as difficult thing to wrap my mind around. Not only must I complete a manuscript, but also market it so it actually sells. That’s the hardest part in my opinion. Robby G, there’s such a big difference between writing a book and selling that same book, many people have a problem making the leap. But once you get into it, I bet you will enjoy it. That’s when you get the payback for all the time, money, energy and effort you’ve put into your book. And it’s pretty creative too! Thanks for adding to the conversation. @April, thanks for stopping by! You are a great example of advocacy (although you’re a lot more than that!) and I am a fan. @Andre, if you use some of the resources available to you on the web, like Lulu.com, you can publish your book without spending anything. You should research this carefully to see if it is the right direction for you, but if it’s only money that’s stopping you, there are ways around that. Lulu will not charge you up front, but you will have to do some of the work yourself. This comment was just what I needed to read. I have been on Lulu.com, but I thought that I would have to pay the money up front. I do not, as of yet have my book “book format ready”, Does Lulu do the correct formating, or do I do all of the heading, and page numbering myself? Thanks for the shout-out, Joel! I just created a coloring book for women. I do not have the funds to take it further. I desire to self publish because I have other projects as well. Any idea’s on getting funding?